Parents in the US and other societies are increasingly refusing to vaccinate their children, even though popular anti-vaccine myths – e.g. ‘vaccines cause autism’ – have been debunked. 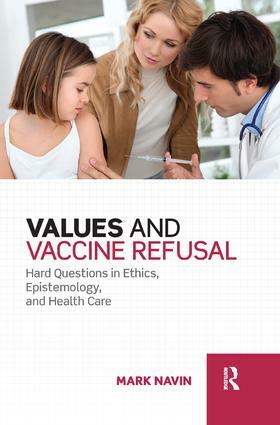 This book explains the epistemic and moral failures that lead some parents to refuse to vaccinate their children. First, some parents have good reasons not to defer to the expertise of physicians, and to rely instead upon their own judgments about how to care for their children. Unfortunately, epistemic self-reliance systematically distorts beliefs in areas of inquiry in which expertise is required (like vaccine immunology). Second, vaccine refusers and mainstream medical authorities are often committed to different values surrounding health and safety. For example, while vaccine advocates stress that vaccines have low rates of serious complications, vaccine refusers often resist vaccination because it is ‘unnatural’ and because they view vaccine-preventable diseases as a ‘natural’ part of childhood. Finally, parents who refuse vaccines rightly resist the utilitarian moral arguments – ‘for the greater good’ – that vaccine advocates sometimes make. Unfortunately, vaccine refusers also sometimes embrace a pernicious hyper-individualism that sanctions free-riding on herd immunity and that cultivates indifference to the interpersonal and social harms that unvaccinated persons may cause.